UPSC CAPF AC 2015 Admit Card Released- Download UPSC AC 2015 Call Letter Hall tickets upsc.gov.in. Union Public Service Commission has uploaded online admit card on 24th June 2015 for UPSC Central Armed Police Forces (Assistant Commandants) Examination 2015. UPSC had scheduled UPSC Assistant Commandant Exam 2015 on 12th July 2015 (Sunday) across all over India. UPSC has released official notification about release of e-admit card of Assistant Commandant Examination 2015. The process to download e-admit card of UPSC CAPF AC Exam 2015 and instructions to use UPSC Admit card 2015 in the CAPF AC Examination are given in official notification released by UPSC. UPSC has also uploaded the list of rejected application of the candidates with reason of rejection on official website www.upsc gov.in. UPSC has not uploaded admit card of CAPF Assistant Commandant Exam 2015 for these candidates. 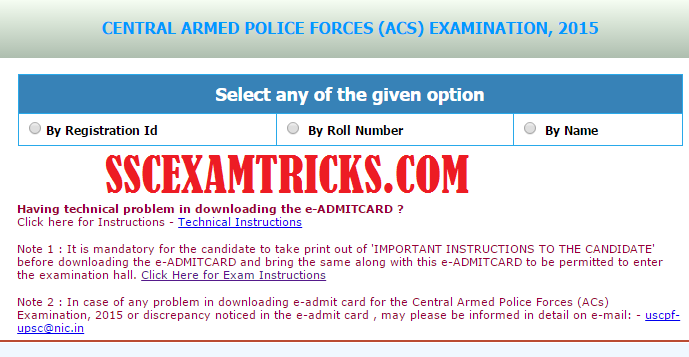 The eligible candidates can now download Admit Card for UPSC CAPF Assistant Commandant Examination. Candidates can download online admit card by two methods. Admit card can be downloaded first by using their registration number and second by using their name of candidates. 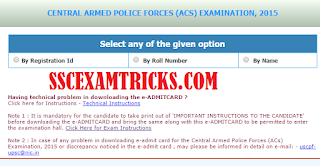 How to download Admit Card for UPSC CAPF AC Exam 2015: It is easy to download UPSC Admit Card for Assistant Commandant Exam 2015. Click on the direct link to download Admit card for UPSC CAPF AC Exam 2015. Choose any of the method to download UPSC Admit Card 2015 for CAPF AC Exam 2015. Enter registration ID or name of candidates. Click on submit button. Take a printout of admit card for UPSC CAPF AC Exam 2015. Candidates must remind that they will have to produce the printout of their UPSC Admit Card 2015 to get admitted in UPSC CAPF AC Exam 2015. The date, time and venue of examination will be mentioned in UPSC AC Call letter 2015. It is mandatory for the candidates to affix recent passport size photograph on UPSC Hall Ticket 2015 in case the photograph is not visible or available on the e-Admit Cards. It is advised to the candidates that they should carry one identical photograph for each session. The candidates must remember to bring proof of Identity such as Identity Card or Voter Identity Card or Passport or Driving License and the printout of UPSC Admit Card / Call Letter/ Hall Ticket at the venue of the examination. All the candidates must note that No Admit Card will be sent by post for UPSC CAPF AC Examination 2015 by the Commission. In case any candidates don’t found their roll number uploaded on official website www.UPSC CAPF AC.nic.in on 24th August 15, the candidate must contact UPSC CAPF AC Special Examination Branch between 9.00 AM to 5.00 PM on or before two days prior to UPSC CAPF AC 2015 Exam Date. The candidates should reach with certain proofs viz. two coloured photograph as attached during registration, copy of Hard copy of online Application form or Confirmation Page, a copy of payment e-challan and 10th Class DMC (Attested copy). · It is mandatory to produce UPSC CAPF AC admit card 2015 (downloaded by website and printed Hard copy affixed with Colored passport size photograph) before getting entry into the examination hall. · No candidate will be permitted to appear in the examination without UPSC CAPF AC admit card 2015. · UPSC CAPF AC 2015 Admit card will be checked along with valid photo identity proof of the candidates at the venue of written examination by duty officers. · Affix colour photograph of same image as provided in the printed Admit Card to the provided space. Do a cross signature on the pasted colored photograph pasted by the candidate. · Admit Card must be signed properly below the Colored photograph paste by the candidate. The signature must be same as it is appeared in the computer generated admit card. · Use of mobile phone/Calculator/Electronic gadgets is banned in exam room. · Candidates can download their admit card any time on the official website direct link mentioned in this page. UPSC CAPF AC Recruitment 2015 Notification had released on 25th April 2015 to 15th May 2015 against EXAMINATION NOTICE NO.08/2015-CPF for the recruitment of 304 posts of Assistant Commandant in Central Armed Police Force. A huge numbers of candidates had applied for UPSC CAPF AC 2015 Exam and waiting for online UPSC CAPF AC Admit card 2015. These candidates can download online UPSC CAPF AC Admit card 2015 from the direct link provided here on this page whenever it gets released on official website. In this paper candidates will be allowed the option of writing the Essay Component in English or Hindi, but the medium of Precis Writing, Comprehension Components and other communications/language skills will be English only. Candidates can download Reasoning tricks, English Tips Techniques, Math short cut tricks with memory techniques based on Time Management concept of read once and memorize forever to achieve good result and cut off marks in UPSC CAPF AC Exam 2015.